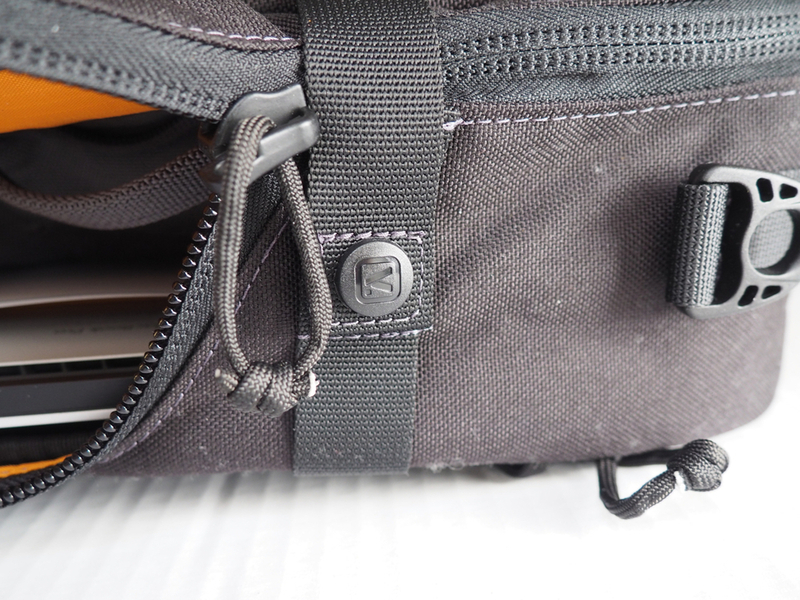 quality — the build quality of this bag is top notch. Threads are straight and well sewed. Zippers are smooth — in fact getting smoother with usage. Plastics on buckles are strong and well molded. We are in contacts with the bags we carry all the time, and the quality feel adds to the enjoyment of the bag. 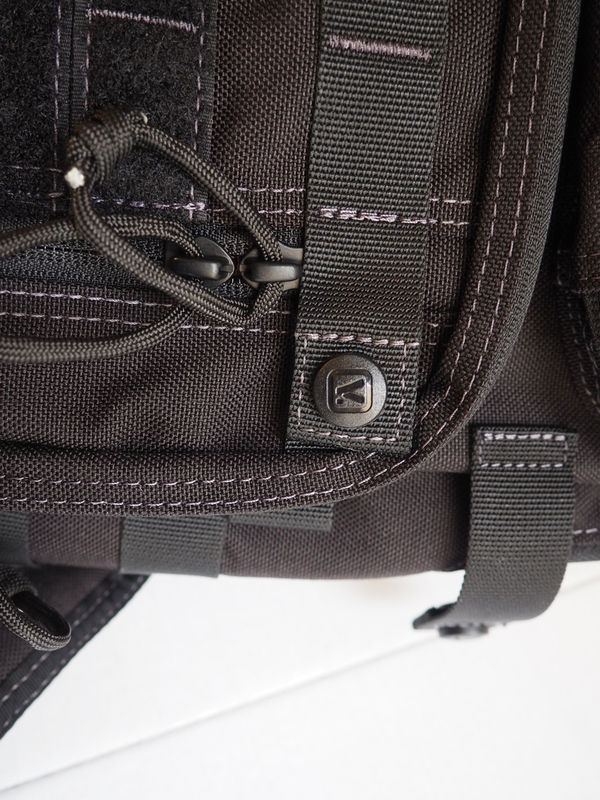 design — There are a lot of nice details in the design of the bag that make it very functional. 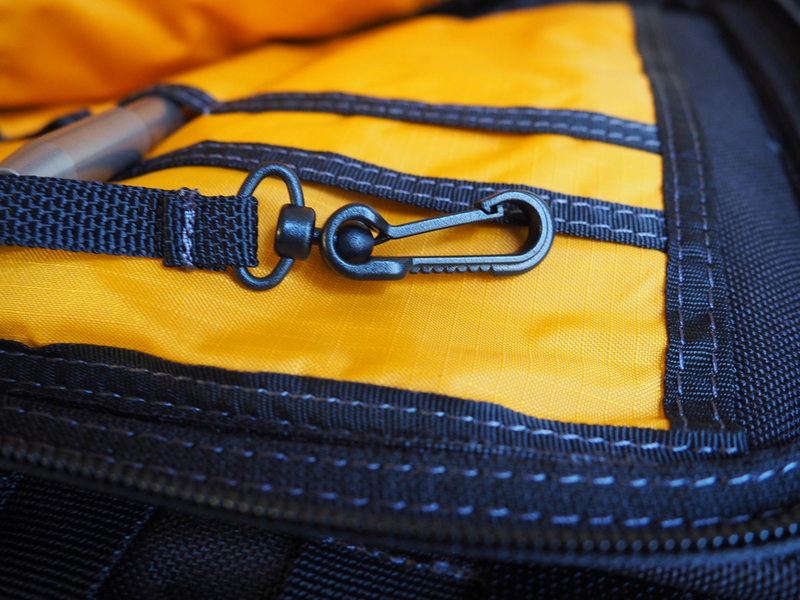 One particular — the C shape zipper opening of the main compartment — makes getting items in and out of the bag while on body or off body very easy. I love this design. Placement and padding of the top carry handle, the bottom grab handle for pulling the sling forward while on body, are all very well designed and executed. The orange interior color — I like bright color interior. It helps locate items in the bag. Carry comfort — the sling strap is wide and padded. The strap geometry is just right. This is one of the most comfortable bags I have. The bag is not wide enough for carrying a 13 inch macbookPro and a lot of other items. 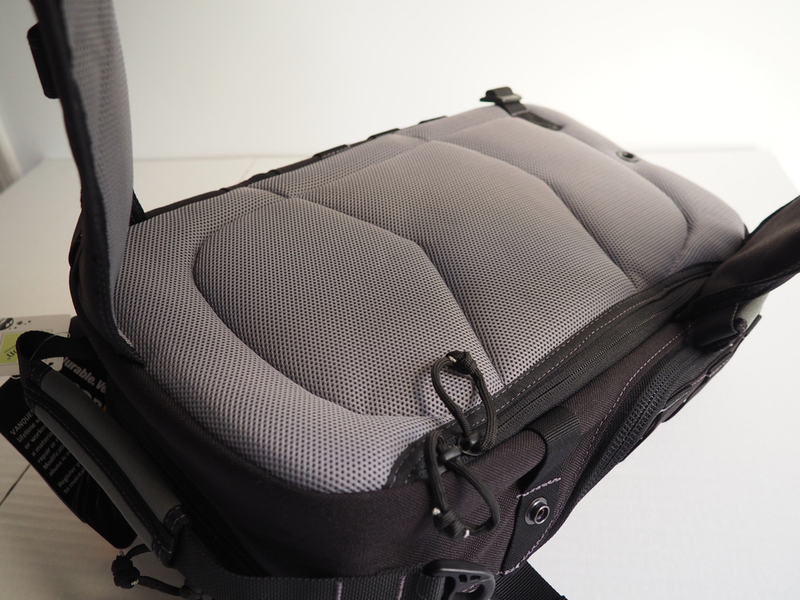 The MBP will fit, but stretches the main compartment enough to make carrying a lot of other items difficult. The bag is also not wide enough to carry letter size paper portfolio (which tends to be slightly wider than letter sized). Too much velcro — while I understand that for a sling bag, internal compartments have to be useful in two directions. Therefore a velcro closure on the large internal pockets make sense. However, for use in an office environment, the velcro is loud. Also it is hard to open, particularly the big pocket inside the main compartment one handed or in one go. I often have to “tear” the velcro with two or three pulls. For my use I would love to see a zipper closure instead — while understand that a zipper makes the opening and ease of putting things in and out a bit harder. 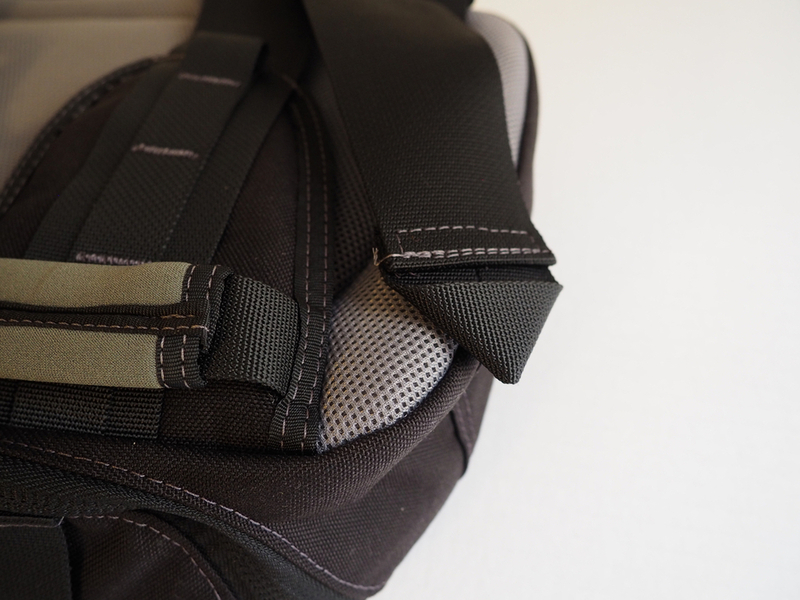 There is no water bottle pocket — I understand for a sling bag it is hard to design in a water bottle holder that works in two different orientation though. This is a great bag that became my main EDC bag weekdays and weekends. I can’t wait to get my hands on the 3.0 version — and hoping that it is expanded in width as Vanquest has said so that it can more easily carry a laptop and paper. Love the Vanquest bright orange interior. Very easy to find things. This one is in the front admin pocket. There is another on the side admin pocket. Always keep a sharpie in the bag. Initially I put my large wallet here. I since moved the wallet to the front zip pocket in front of this admin pocket. (I do not use this wallet much. I carry a slim wallet in my front pants pocket). Wallet in the front zip pocket, "lockable"
Good for smaller items. I sometimes put my car keys in here. My Klipsh X11i goes into here. This is what I carry in my Tumi daily to the office. At the end I could not fit the umbrella, nor my papers in the plastic protector case in the VSlinger. My 13 inch retina Macbook Pro actually does fit into the VSlinger if the big is not too stuffed. The plastic paper protector that I use in my Tumi messenger does *not* fit into the VSlinger. It is slightly wider than a 8.5 x 11 piece of paper because it protects the paper with extra plastic. The VSlinger is too narrow for it. Luckily I do not need to carry letter size paper normally. A small pocket in the flap area, useful for small infrequently used items? This bag is very comfortable to carry. The back is well padded. I really like this feature. When you are wearing the bag, you can reach for this handle to pull / swing the bag to the front. There is a removable cross strap for stabilizing the sling.